Championing everyone's right to be happy and healthy, Walgreens™ proudly returns as the exclusive retail partner of the second annual Red Nose Day, helping raise funds to fight kids' poverty. The campaign's iconic Red Noses - which people wear in support of the official Red Nose Day on , May 23 - returned to store shelves at Walgreens and Duane Reade locations nationwide this morning, officially kick starting the nine-week charitable campaign. Following the sell-out success of last year's inaugural Red Nose Day, Walgreens is going beyond the nose in and raising funds through the sale of new Red Flair merchandise, also available nationwide starting today. From red hats and springy novelty headbands to oversized sequin bowties and Red Noses for cars (to name a few), Walgreens is making it even easier for Americans to "Get Seriously Silly" in support of a great cause. Between now and the official Red Nose Day in May, Walgreens hopes to sell significantly more Red Noses than the 5 million it sold last year. To help meet its goal, Red Noses and Red Flair hit Walgreens shelves two weeks earlier this year, giving Americans even more time to "Get Seriously Silly" in support of a great cause. 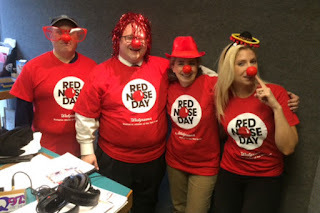 Starting today and continuing through June 4, Walgreens and Duane Reade locations nationwide will sell Red Noses for $1 each and Red Flair items for between $1-$5.99. Proceeds from Red Nose and Red Flair purchases benefit the Red Nose Day Fund* which supports charities with domestic and international reach aimed at fighting childhood poverty, including Boys & Girls Clubs of America; charity:water; Children's Health Fund; Covenant House; Feeding America; Gavi, The Vaccine Alliance; National Council of La Raza; National Urban League; Oxfam America; Save the Children; and The Global Fund. In the UK, Red Nose Day has raised more than $1 billion since it launched over 25 years ago and is an inspiring cultural phenomenon that unites people from all walks of life in the interest of saving and changing lives. The inaugural Red Nose Day event in the U.S. took place last May and raised more than $23 million to help kids in need in America and abroad. This year, Red Nose Day's nine-week campaign will culminate in a live, two-hour broadcast on NBC airing on May 24 (9-11 p.m. ET). The Red Nose Day Special will feature popular comedians, top musicians and Hollywood stars in an engaging mix of comedy, live musical performances and short, compelling films shedding light on the cause. Red Nose Day (rednoseday.org) is a fundraising campaign run by the nonprofit organization Comic Relief Inc. (comicrelief.org), a registered 501(c)(3) public charity. Red Nose Day has raised over $1 billion globally in the past 25 years, and in the UK has become a cultural phenomenon where people across the country come together to have fun, raise money and change lives.